Cucumbers with sesame peanuts and mint make for a vegetarian, low-cal umami explosion. On their own, cucumbers can be bland. But this versatile veggie is the perfect vessel for an array of flavors; that's why they're popular in cuisines from all over the world! Because cukes have such a light, bright flavor, I like to contrast those qualities with richer, savory ingredients. 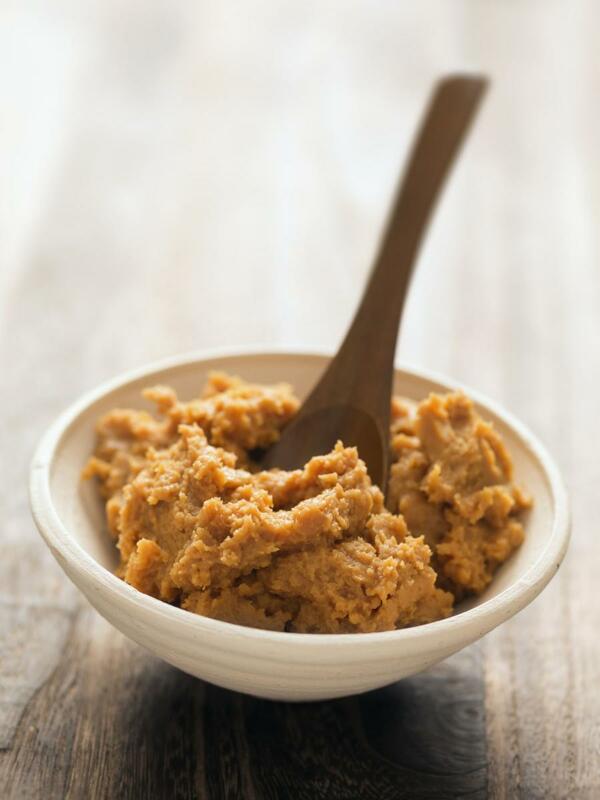 Miso paste — the Japanese seasoning and condiment made from fermented soybeans — isn't just for soup. It adds wonderful depth to dressings and marinades, and even baked goods, and can range in color from light to dark. For this recipe, I like to use red miso, which has a more intense flavor than its fellow white or yellow miso pastes due to a longer fermentation. Whisk into a simple dressing flavored with lime, ginger and sesame, and you've got a fast, healthful flavor booster on your hands. Just toss with the cucumber, roasted peanuts and fresh mint for a resolution-friendly dish. 1. Set the oven at 400 degrees and line a baking sheet with parchment paper. 2. In a large mixing bowl, add the cucumber slices. Squeeze half of the lime on the cucumber slices, and toss to coat. Reserve the other lime half for the dressing. Place in the fridge, covered, until ready to dress and serve. 3. Place the peanuts on the lined baking sheet, and toss with 1 teaspoon of the sesame oil, 1/4 teaspoon of the cayenne pepper, and 1/4 teaspoon of the ground ginger. Stir to combine, and place in the oven for 6 minutes or until toasted and golden. 4. Meanwhile, prepare the dressing. In a small bowl, whisk together the miso paste, garlic, rice wine vinegar, juice from remaining lime, remaining sesame oil, cayenne, and ginger. 5. Whisk in the olive oil until the dressing is thick and is a smooth consistency. Season with salt and pepper, to taste. 6. Remove the toasted peanuts from the oven, and allow to cool. 7. Transfer the cucumber slices to a serving dish, drizzle with the miso dressing, and garnish with the mint leaves and the toasted peanuts. Season with additional salt and pepper, if you like, and serve.